This is a single Electrical Resistivity Imaging Instruments Image to act like a header image. below the ground’s surface. Engineering geophysics incorporates electrical earth resistivity methods in various applications, which range from characterizing geologic conditions at a depth of 100’s of feet to measuring the electrical resistivity of a sample placed in a small handheld container. As an example, earth resistivity measurements can be used to map out clays, sands, gravels, frac sand deposits, types of rock, levee areas, groundwater, fracture joint systems, faults, karst features, variations in porosity, changes in cementation, voids, graves, archaeological sites, groundwater contamination, and saltwater intrusion, to name a few. For help today, fill out Earth Resistivity.Com’s form. Scroll down to skip over the form or go to the bottom of this page and leave a comment for someone to help you find an answer about earth resistivity geophysical methods. We will respond. uses little electrical power to measure the resistivity of near surface soils. Determining the electrical resistivity of the subsurface for a ground plane around a large power plant or for geologic conditions 100’s of feet below grade usually demands a larger more stable power supply than a unit powered by a few AA batteries. Larger earth resistivity meters that utilize automobile sized batteries or even gas powered generators generally fall in to the category of geophysical instruments and can be rented from K.D. Jones Instruments. This type of geophysical equipment is designed not only for greater depths of penetration, but for adverse weather, rugged field conditions, and poor site conditions. In my opinion, good electrical resistivity equipment is built by a hand full of manufactures. Two U.S. companies that have worked hard at meeting the geophysicists’ needs are AGI and Geometrics. One of AGI’s most popular units is the SuperSting R8. In addition to being capable of acquiring profile data or resistivity soundings, it is a programmable multiple electrode resistivity MER system capable of acquiring 1000’s of readings with a single array setup. The arrays come in unlimited lengths and configurations. An 84 electrode system with takeouts spaced 5.25 meters apart can reach 100’s of feet deep. 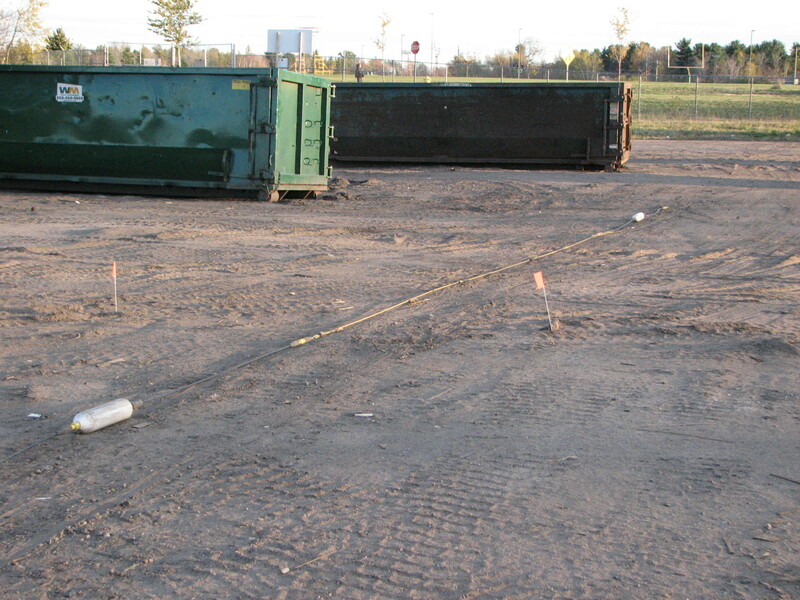 A 2-D resistivity line can be “rolled” end to end for as far as you have space. The same system can be configured to detail the top 10 feet of soil or create a 3-D electrical resistivity representation of the subsurface. The unit is programmable for multiple array configurations (e.g. Wenner, Schlumberger, Dipole-Dipole, Pole-Dipole, Pole-Pole, or user defined). While the SuperSting provides a variety of possibilities, it is mostly used along a single straight line and can not be towed. In contrast, Geometerics OhmMapper is a towed array that is cable of covering spatially large areas, such as, fields, parking lots, landfills, and large commercial sites. The unit is generally towed by a person (sometimes a vehicle) and is pulled across a site from one end to the other. Using the OhmMapper to acquire closely spaced lines, allows the geophysicist to map lateral changes across a site. 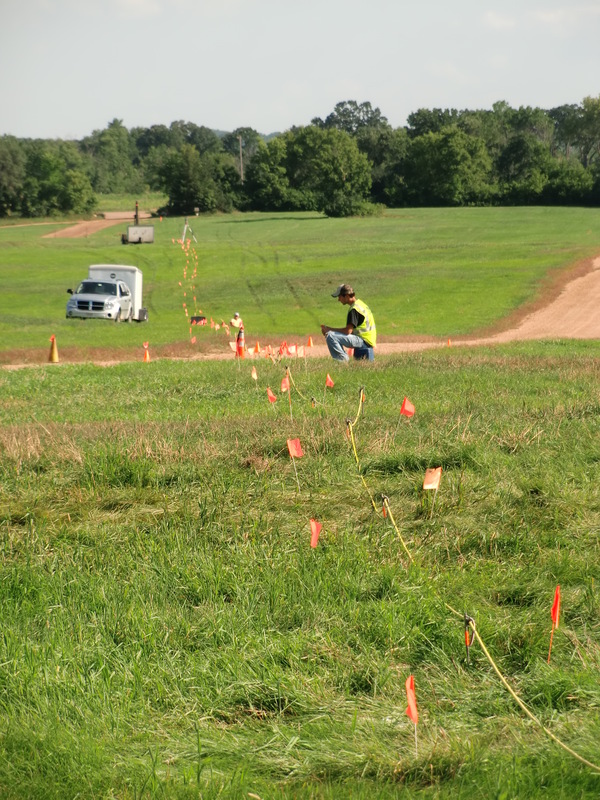 Multiple lines along a single transect can yield cross-sections of electrical resistivity, much like the SuperSting.